If you were to Google the term, “games like Fortnite,” Creative Destruction would fill the first 50,000 pages of results. Adopting the ultra fashionable battle royale gameplay model, it looks, sounds, and feels uncannily like the most successful game of 2018 – which, put like that, is probably a good strategy. There are differences, though, and Creative Destruction is no pale imitator. It’s a vibrant, confident, powerful imitator, and any battle royale fan is sure to get a kick out of it. Let’s start with the basics. Creative Destruction sees you skydiving from a weird flying bus onto a huge 4x4km island, where up to 99 other players are waiting to duke it out for the ultimate prize: survival. You always drop onto the same island, which is made of up of several different environments, including a snowy area called, a grassy savanna, a rocky region, and several kilometers of coastline. While the island never changes, where you play on it does. That’s because each round sees the playable area shrinking in stages as an encircling deathzone closes in. This always closes in on a different part of the island, meaning every match ultimately takes place in a new environment. Assuming you play in the Solo mode, which is the default and the most popular, you’ll generally find the opening minutes of each match running around on your own in third- or first-person, searching buildings for weapons to augment your basic, and completely harmless, Destructor. You move with a virtual stick on the left of the screen, while an array of context-sensitive buttons on the right let you shoot, jump, crouch, open crates, and build. There’s a shoot button on the left, too, so that you can aim with your right hand and fire with your left. Eventually, and hopefully tooled up, you’ll be shepherded along with your opponents into a tiny area for the final showdown, if you make it that far. Weapons fall into the usual categories – shotguns, pistols, SMGs, assault rifles, bazookas, sniper rifles, and grenades – and you can get them through airdrops as well as scavenging. Or, if you’re skilful, you can claim them from your fallen foes, along with health packs, ammo, and so on. That’s the shooty shooty stuff covered, but – like Fortnite – Creative Destruction also contains plenty of buildy buildy stuff. One of the things you collect – usually by smashing stuff up with your Destructor – is material with which to quickly create structures. These play a central role in battle, giving you a shield to hide behind, a platform to shoot from, and more. There are a handful of different build types available – up and down ramps, walls, floors, and room-sized boxes – and these go together to make all manner of edifice. The difference between a newbie and a skilled player is not in the shooting but in how they use their magical construction and destruction skills to mould the battlefield to their advantage. A duel between two pros contains more building than shooting. One surprizingly significant difference between Creative Destruction and Fortnite is how easily these structures can be punctured and torn down. It’s much easier in Creative Destruction, which injects even more dynamism into the battles. There are several playing modes, including Solo, Duo, Squad, and Fireteam. The game contains training modules too, helping you master everything from parachuting to building. And for this month only a special Bumblebee event sees you hurtling around the island in a car with another player, hoping to claim the prize of driving Bumblebee himself. There are daily missions to complete, guilds to join, and several currencies to collect or buy with real money. You can spend these on a huge variety of cosmetic and practical items. 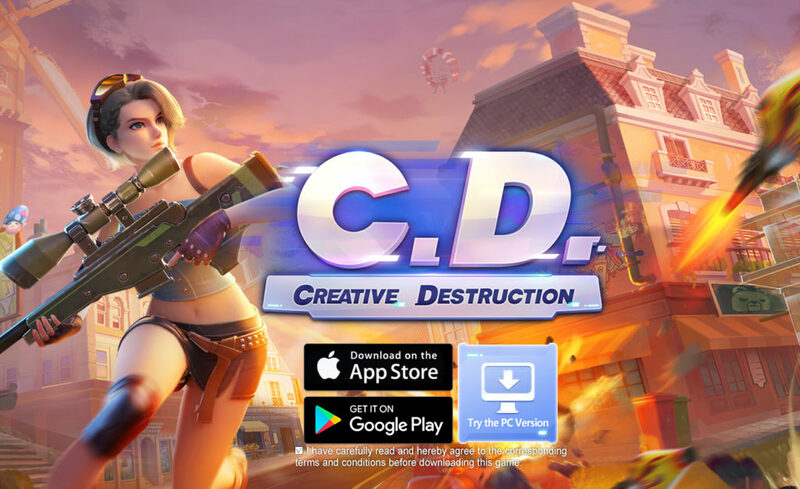 Check out Creative Destruction on Google Play now – download it here if you’re located in Europe or Japan, and here if you’re located anywhere else. Creative Destruction has everything you’d expect from a battle royale game. And while it’s not particularly original, it’s one of the slickest and most enjoyable takes on the genre so far.